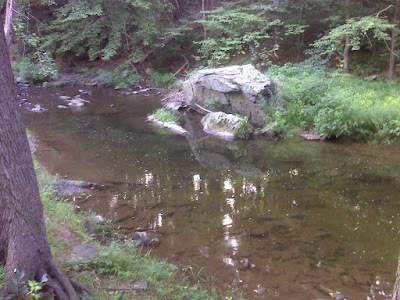 "The Big Rock" swimmin' hole on the Middle Branch of White Clay Creek near Chesterville, PA. This was the epicenter of my best childhood memories. Photo up top is the view taken as I hiked through a few days ago. Lower left photo was taken in 1961 with me, my brother, and family friends, and the lower right photo, taken in 2008 includes the next generation, my kids. Since my Dad's passing I've been hanging around my old stompin' grounds helping Mom. It's been a tough time for us but the light of a new day is beginning to brighten the horizon, and I'm finding some time to get back on the trails, doing some hikes around home. Home for me means White Clay Creek. 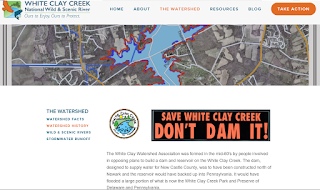 In 2000 Congress designated the entire White Clay Creek watershed as a national Wild and Scenic River. It was the first complete watershed in the nation to receive that designation. I grew up on what's called the Middle Branch of White Clay Creek. 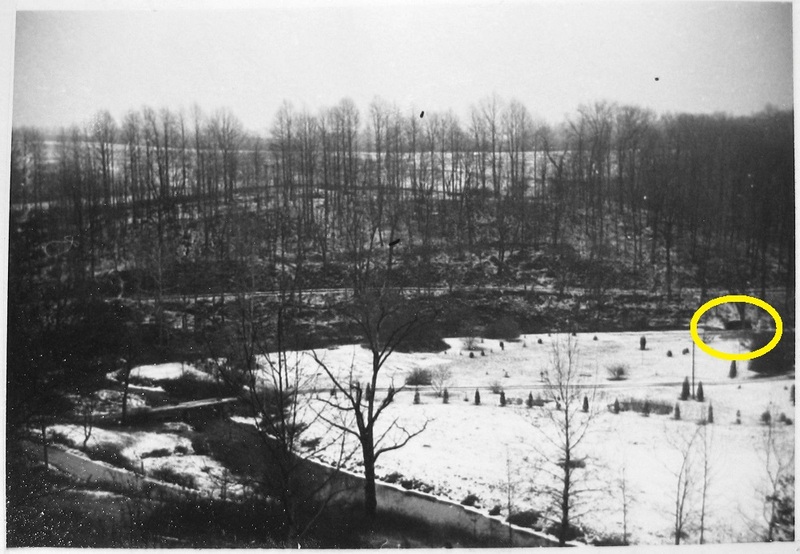 Our property was set on a sharp bend in the stream that can be seen in this winter photo from 1969. "Meadow Creek," my old stompin' grounds. The 'Big Rock' is the dark rectangle at right. Downstream from us was a lot of wild wooded land. 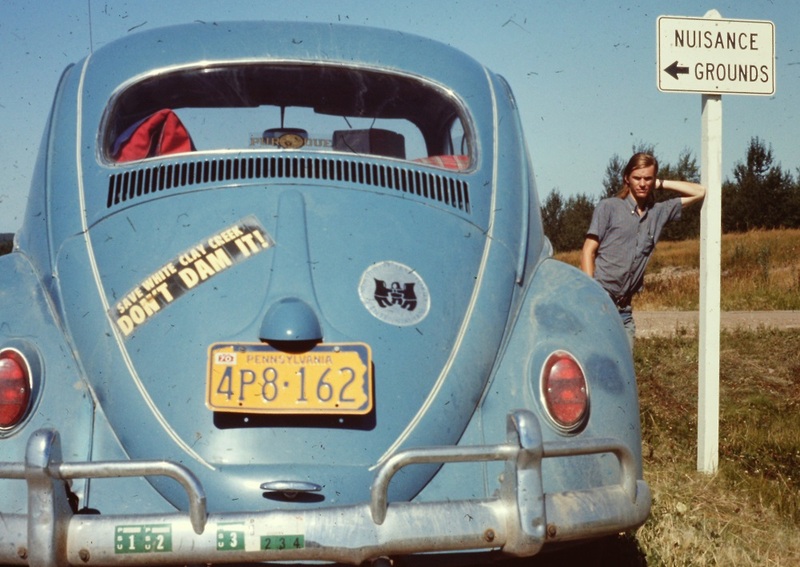 In the late 1950's DuPont company started buying up land in the watershed, intending to build a dam that would have flooded 1160 acres and supplied 71 million gallons of water a day. They were concerned that the existing water supply was not enough to support planned expansion of two of their production plants in the Wilmington area. The protests worked. 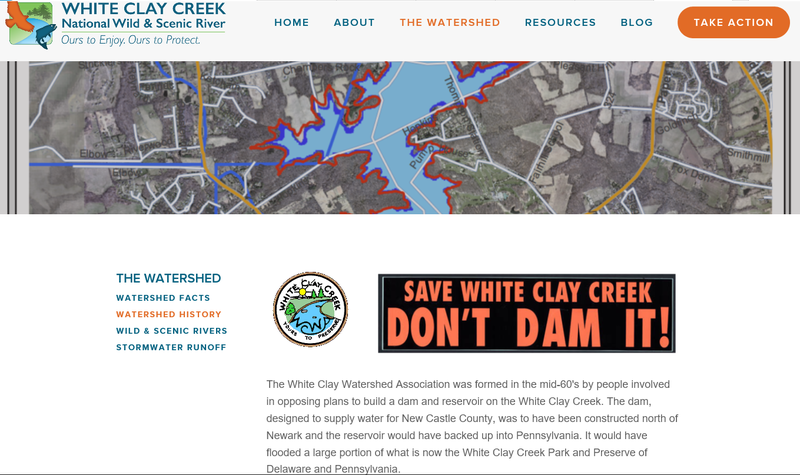 Ironically DuPont's extensive land acquisition kept the most critical areas from development and made White Clay Creek preserve possible. The dam project was abandoned and in 1984 DuPont generously donated all that land to the states of Delaware and Pennsylvania. Evidence of the DuPont presence still remains. Here an old DuPont de Nemours Company 'No Trespassing' sign is being slowly swallowed by an ancient American Beech tree along the Mason-Dixon Trail. From when my family bought the 'Meadow Creek' property in 1956 until I went off to college ten years later my brother and I spent endless hours in and around the waters of White Clay Creek, swimming, building dams, playing in the sand, fishing, and taking what we called 'creek walks' where we hiked long distances up and down the stream bed, making a point never to leave the water. The creek walks were great fun. Back then the stream bed was the only clear route through the more remote stretches of what's now White Clay Creek Preserve. 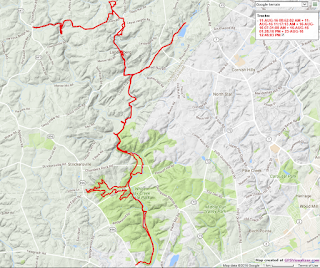 Now there are a plethora of great hiking trails in the area, the main concentration of which are in and around White Clay Creek Preserve and Delaware's White Clay Creek State Park. The Preserve and the Park were developed long after I left the area, and somehow I've never come back to hike these new trails. It was long overdue. Of course I had to do it my way, that is, by connecting these trails with my previous hikes across the area and the nation, including in my path all the places I've called home. That's the gist of my long-term 'Personal Continuous Footpath' project. I began at my parents retirement community in Oxford, PA, which I'm calling home these days. I passed eastward through the little town of New London where my Dad is now buried alongside my grandmother and my brother. That will also be my final home. From there I headed on down past 'Meadow Creek' and the Big Rock. Within two hundred yards of the Big Rock there is a short trail through the woods, named after our grumpy neighbor, Mr. Keen. When old Mr. Keen passed away a few years ago his heirs granted an easement to Franklin Township for this modest 1/3 mile trail. 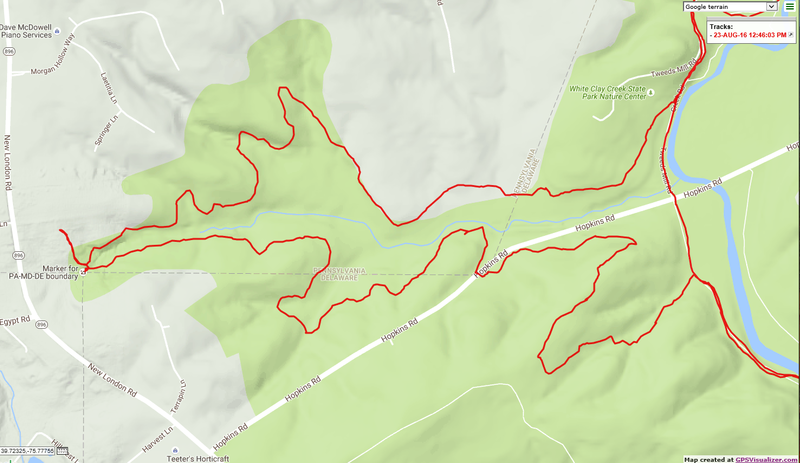 From there it was a 1.4 mile road walk to more excellent new trails in New Garden Township along the East Branch of White Clay Creek above the tiny hamlet of Landenberg. 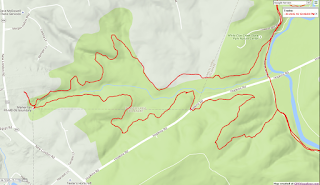 These trails and a few short road walks brought me into White Clay Creek Preserve and hooked me up with the long distance trail that will be my hiking venue for the coming weeks--the 190 mile Mason Dixon Trail, which goes from Chadds Ford, PA to the Appalachian Trail near Boiling Springs, PA. Soon I was meandering back and forth across the state line between Pennsylvania and Delaware. 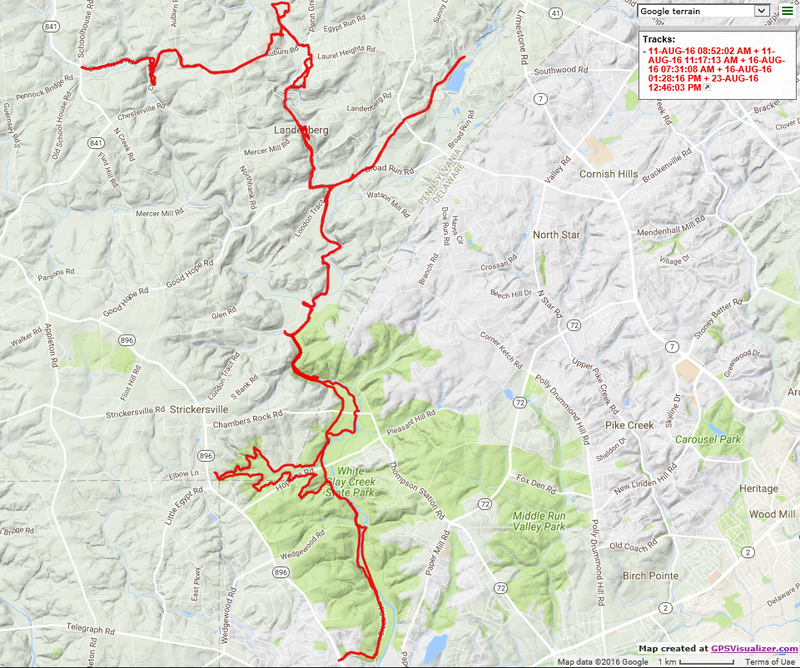 The Mason-Dixon Trail has been re-routed in the past couple of years to take the hiker through a tract of lovely old unspoiled forest to the Tri-State monument (MD, DE, PA) erected in 1849. Three miles later it comes back to White Clay Creek just a third of a mile from where it left it. 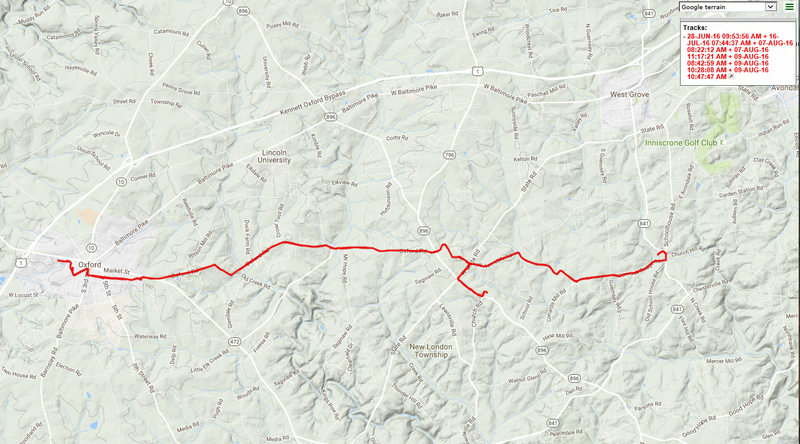 Here's a close-up map of this new reroute, which does not appear on the 2012 'official' Mason-Dixon Trail Association map. With that map as an introduction, here is a pair of wider scale maps of my route. 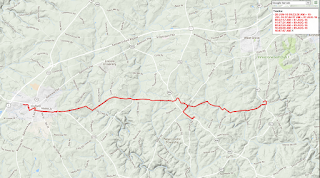 The first one covers the road walk from Oxford, PA and the second shows the hikes along White Clay Creek and the Mason-Dixon Trail. I'll be hiking more of the M-D T in coming weeks as time permits. It's great to be stretching my legs again. Thank you for sharing. Love the old photos of the big rock. The picture with your kids on the bench was right around my fathers death as I recognize the flowers, we had his service down by the big rock. That bench is long gone now as one of the hurricanes that came through uprooted it and carried it down stream. Stop by when you come through this way again!